A few weeks ago we moved away from our old neighborhood where I first saw Sawhorse Cat. However a few days ago my friend Walter (who knows I like pictures of cats) told me he thought he saw him hanging around the old apartment. He even sent me a picture. Walter’s picture is on the left. Walter told me that he wasn’t sure if it was really Sawhorse Cat, because he seemed a little bit different. He seemed like he was flipped somehow. Walter wanted to know how could he be sure this was still the same cat? I told him that if he was really unsure he could make a Newman projection to check. This was no problem, since he read my last blog post. This is what the two Newman projections looked like. 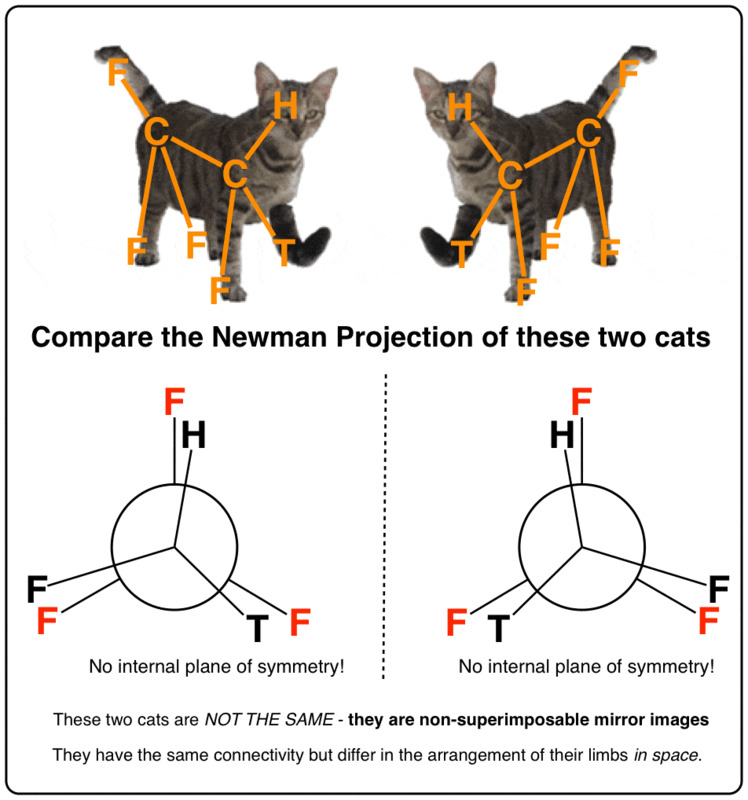 Looking at the Newman projections it’s clear that they are completely identical. Furthermore, if you look closely, you’ll see that Sawhorse cat has an internal mirror plane, looking down the spine. 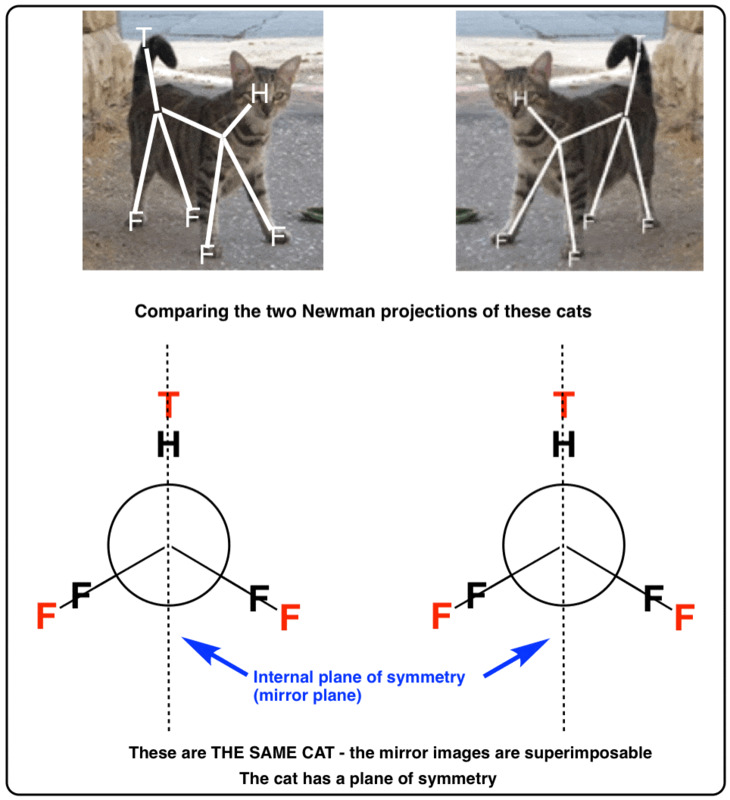 This means that Sawhorse Cat is superimposable on his mirror image. Walter was also aware of Freaky Sawhorse Cat, who was also seen creeping around my neighborhood one day. 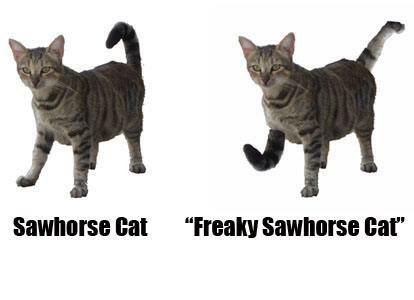 If you recall, Freaky Sawhorse Cat was a close relative of Sawhorse Cat but the limbs were switched around. A few days after he sent me his picture of Sawhorse Cat, he called me in excitement – he’d also spotted Freaky Sawhorse Cat, hanging out near a popular dumpster. I told him to take a picture. After I looked at the picture I called Walter back to tell him that he had not actually seen Freaky Sawhorse Cat. He’d seen a close relative! There was no way this was the same cat I’d taken a picture of. Walter didn’t believe me. They are exactly the same, he said. I told him to make the Newman projection of each cat and have a look for himself. This is what they looked like. Exactly! They are mirror images, but not superimposable. 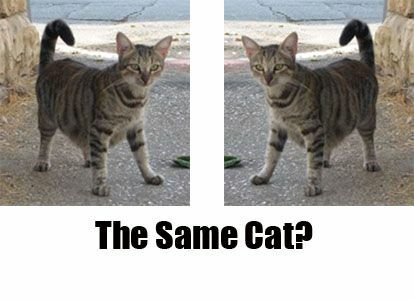 Therefore they are different cats. 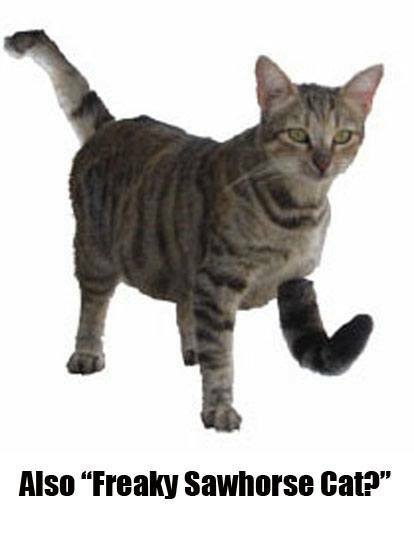 That means that this isn’t Freaky Sawhorse Cat, but a very close relative. “We need a complicated sounding name for this relationship that will impress people”, I said. Walter, being a professional philosopher, knows his classical languages. After all, he can read Plato and Heraclitus in the original Greek. Who says philosophers can’t make themselves useful? Awesome idea. I could never have thought of that myself. Wow, “mirror images, but not superimposable.” I didn’t see that coming, which is probably why I gave up on chemistry in college. BTW, I’ve heard it said that the perception of facial beauty lies in symmetry. The most common analogy is with hands, which are also non-superimposable mirror images. Re: facial symmetry I’ve heard that said too, but my wife has an adorable dimple on her right cheek only, so I’ve had to modify that somewhat. Love your site! You’ve been blogrolled! You are fantastic. You are actually making me enjoy ochem thanks to these cats! This should be incorporated into ALL ochem courses so us undergrads don’t hate our lives so much.